We make Custom Tire Covers for your Jeep. We make a LOT of them. But on December 12, 2017 we made a post on our All Things Jeep Facebook page that showed a custom tire cover the we definitely did NOT make. Here's the photo we posted. And here's what we wrote: "Truth be told, we didn't make this custom tire cover for this guy. (But we applaud his initiative and would love to know the outcome.) But we DO make custom tire covers so if you have your own photo or story you want the world to see on the back of your Jeep, we can do it for you. A week or two later we got an email from a gentleman named Greg. This was Greg's Jeep and Greg's ingenious strategy to acquire a girlfriend. We traded emails a bit and we asked him if we could post his story. He agreed and here it is. We love his creativity! So I was single and trying to figure out how to meet women without having to resort to internet dating. I'm not into sports due to life long knee issues, and not a bar fly. I thought a guy in his Late 40's should be able to find a woman without involving the world wide web. Late March 2016 I was stopped at an intersection behind a fellow Jeep Wrangler. It had a tire cover that read "Life is good". It was at that moment, those short few minutes would change my life for ever! In those short few minutes I put together a few key words. Words like "rugged" and "middle aged" and "co-pilot". I thought about my brilliant scheme for about a week. I'd have to use my phone number. My sense of humour pushed me forward, as I never leave home without it! I figured I could use a "flying saucer" type toboggan. Its a round sled, it has handles and would be easy to bungy cord to my spare tire. I could then write my message on it with a permanent marker. The winter season was coming to a close and I needed to act fast. I had two options... $5 or $30. The five dollar model didn't seem big enough and I didn't want to spend thirty bucks. In the end I decided that my brilliant scheme was worth the thirty dollars, and I had my canvas. The wording had to be catchy! 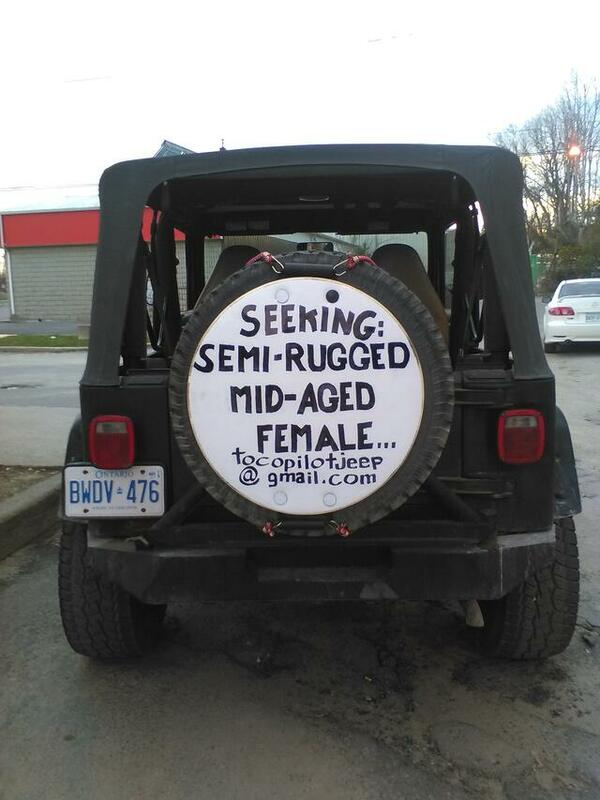 I wanted to use the word "RUGGED" and "middle aged" and "seeking". I needed my message to be clear. I only had so much space to work with. I needed to specify gender, "female" would be just fine. Sign development was under way. I had a friend draw up the first sign (the one you posted on Facebook). 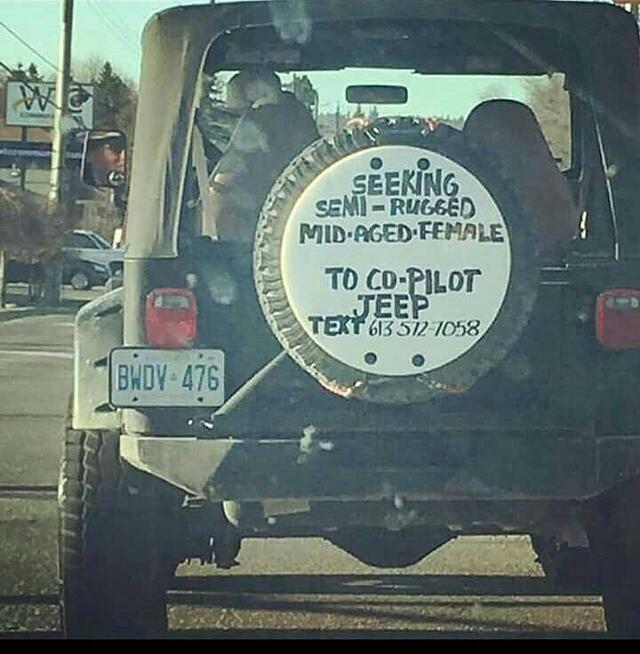 "SEEKING SEMI-RUGGED MID-AGED FEMALE TO CO-PILOT JEEP TEXT my cell number"
I put the sign on my jeep and the reaction from other motorists was astounding. Almost every time I looked in the rear view, the people behind me were taking pictures. They were honking, waving, laughing, giving me the thumbs up etc. to which I responded "holy s**t"! Someone had taken a pic in Kingston, Ontario where I lived at the time and posted it on Facebook. I wasn't even on Facebook at that time, but my friends and family were. The crazy sign (brilliant idea) went viral with 15 000 ish views. I received over 100 texts mostly people just checking to see if it was real. 99.9% of the texts were from the USA. One day I walked past the sign and brushed it with me sleeve. I decided to change it up! The texts were still pouring in. I only received one email, not compatible. She wanted a running partner. With bad knees and a jeep, I'm not running five feet! 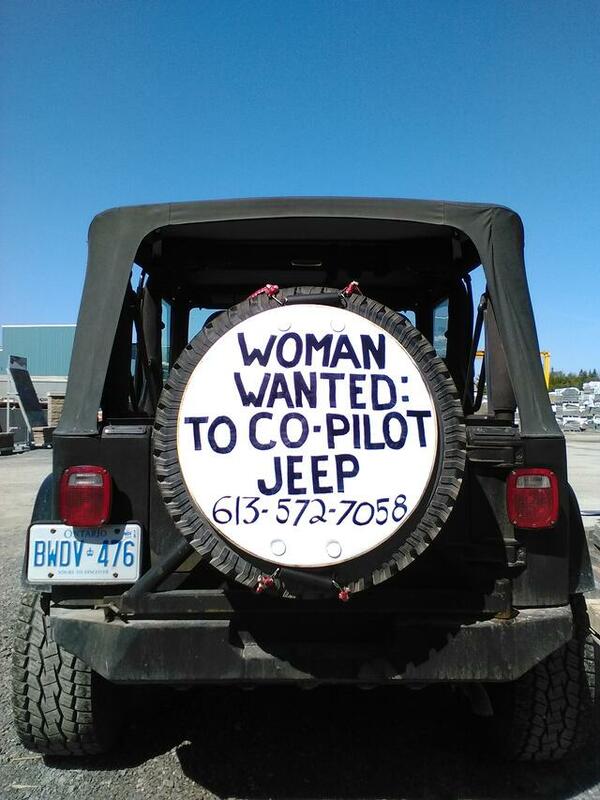 "WOMAN WANTED TO CO-PILOT JEEP" with my number. Number three was on roughly ten days. I was changing it up again and decided to give it a rest. Every now and then I'm reminded that its still out there because someone posts it again and the messages start flowing in. What changed my life for ever are the friendships I've gained. 99.9% of them have their own jeep and have no desire to co-pilot. My friend Terri (American), saw your post and contacted me.